Decades before the fur traders and wagon trains, the 33 members of Lewis & Clark Expedition’s Corps of Discovery found its way to the environs of the pacific northwest wonderland, mapping the region and its rich flora and fauna. The native tribes they met along the way led the explorers to the best spots and specimens, sharing their wisdom on the plant’s natural cycles and uses for food, medicine, and implements (baskets, arrowheads, etc.). The expedition’s return journey upriver, leaving Fort Clatsop after a rainy winter in late-March of 1806, was particularly fortuitous in capturing, through sketches and notes, the many wildflowers of the Columbia River’s spring display. Capt. Lewis’ journal entries wax poetically, while William Clark’s entries were more terse scientific records. You can view their original leather-bound journals at the American Philosophical Society in Philadelphia, PA.
Frederick Purse(1774-1820), a gardener who emigrated to Philadelphia from Germany, made extensive studies and hand-colored engravings of the plants collected on the Expedition. Twenty four plates were included in his Flora Americae septentrionalis (Flowers of North America) subtitled “ A systematic arrangement and description of the plants of North America : Containing, besides what have been described by preceding authors, many new and rare species, collected during twelve years travels and residence in that country” published in London in 1814. Despite dying a destitute drunk, he is commemorated by the genus Purshia (bitterbrush) for his contributions to botanic history. “The expedition was commissioned by President Thomas Jefferson shortly after the Louisiana Purchase in 1803, consisting of a select group of U.S. Army volunteers under the command of Captain Meriwether Lewis and his close friend, Second Lieutenant William Clark. Their perilous journey lasted from May 1804 to September 1806. The primary objective was to explore and map the newly acquired territory, find a practical route across the Western half of the continent, and establish an American presence in this territory before Britain and other European powers tried to claim it. The campaign’s secondary objectives were scientific and economic: to study the area’s plants, animal life, and geography, and establish trade with local Native American tribes. 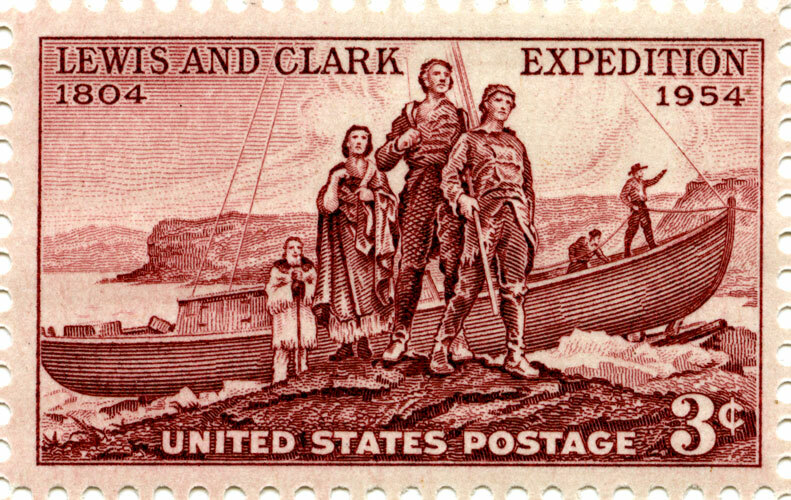 With maps, sketches, and journals in hand, the expedition returned to St. Louis to report their findings to Jefferson.” — “Lewis and Clark Expedition” Wikipedia (2016). “Lewisias… a group of plants with thick, fleshy roots named after Meriwether Lewis of the Lewis and Clark Expedition. The best-known is the bitterroot, Montana’s state flower and after which the Bitterrroot Mountains were named; it was extensively dug by the Indians and was one of the plants brought back by the Expedition. One of their purposes being to gather information about the natural resources of the area, the Lewis and Clark team collected specimens of plants with edible roots or bulbs including camas, several lomatiums, spring beauty, glacier lily, balsamroot; berries such as salal, salmonberry, ocean spray whose branches were used for arrows. They first described in detail the grizzly bear, pronghorn, mule and Columbia beaver and prairie dog. Two birds were named after them, the Lewis woodpecker and Clark’s nutcracker. The latter has recently been discovered to be influential in the spread of whitebark pine in timberline areas, as this bird makes seed caches which sometimes are not eaten. Several other plants commemorate their names: clarkia; the syringia Philadelphus lewisii, which became Idaho’s state flower; and the Lewis mimulus. Other flowers … brought back by them, are trillium, scarlet gilia, and bistort.” — Wildflowers of Mount Rainier and the Cascades, Mary A Fries, Bob and Ira Spring, for the Mount Rainier Natural History Association and The Mountaineers (1970). This interview with Joan Hockaday, a northwest author and garden historian, includes more information on the wildflowers and the Columbia Gorge as encountered by the Corps of Discovery.